Field terminated punch down block with 75 pair capacity. Quick Clip: 842. Uses SB6 stand-off bracket for mounting. 66 Connecting Blocks enables you to quickly organize and interconnect phone lines and communication cable. 66 Block system is used in equipment rooms or in remote and intermediate wiring closets to connect voice or data wiring to customer premise equipment. Blocks are molded of flame retardant thermoplastic with quick-connect 66 clips for ease of installation and proven termination reliability. A 66 block (also M-Block) is a type of punchdown block used to connect sets of wires in a telephone system. 66 blocks are designed to terminate 22 through 26 AWG solid copper wire. 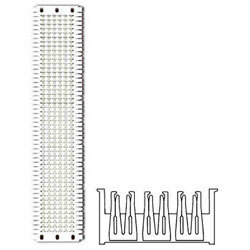 25-pair standard non-split 66 Block contains 50 rows, each row has four columns of clips that are electrically bonded. The 25-pair "Split 50" 66 Block is the industry standard for easy termination of voice cabling, and is a standard network termination by telephone companies–generally on commercial properties. Each row contains four clips, but the left two clips are electrically isolated from the right two clips. 66 blocks pre-assembled with an RJ-21 female connector are available that accept a quick connection to a 25-pair cable with a male end. These connections are typically made between the block and the CPE (customer premise equipment). Circuit pairs are connected to the block with a punch-down tool by terminating the tip wire on the leftmost slot of one row and ring wire on the leftmost slot of the row beneath the mating tip wire. Typically, a 25-pair cable coming from the phone company is punched down on the left side of this block in pairs. The right hand side of the block is wired to the customer premise equipment with jumper wires. Bridging clips are used to connect the two center slots bonding the left-hand side of a split block with its right-hand side, thus completing the circuit. The clips form the point of interface between the subscriber and the provider. The bridging clips can be easily removed by either the subscriber or phone company personnel for trouble isolation, allowing the ability to split a circuit and test which direction trouble may exist. An orange cover attached to a 66 block denotes its designation as a demarcation point by the local exchange carrier. Currently, 66 blocks are considered legacy devices. They are large, compared to more contemporary wire terminating devices, and, due to their maximum 16 MHz Category 3 signaling compatibility, are ill suited for high speed data circuits greater than 10Base-T. 'Split 50' 66 blocks are still used as network interface blocks in distribution frames to interconnect circuits with bridging clips, but are primarily limited to narrowband circuits such as POTS/DSL, DS0, or DS1 circuits. There are however Cat5e Certified 66 blocks available that meet all standards for Cat5e termination. The Leviton 66 Connecting Blocks enables you to quickly interconnect phone lines and communication cable. The block systems can be used in equipment rooms to connect voice and data network wiring to customer premises equipment. Siemon’s 66 wiring blocks provide dependable support to data and voice applications. Siemon Category 5e blocks offer a patented design that has openings between the rows to allow horizontal cables to be routed from behind the panel and enter the block from the rear making installation easy for network managers. This feature also helps to maintain cable geometry and the outer jacket up to the point of termination, giving the user optimum category 5e performance. The 66 block has a similar feature. The ends are open allowing the installer to lay cable in before snapping the block into place. The 66 blocks are available in 50 pair units and have coordinating brackets for mounting. Used in equipment rooms, remote and intermediate wiring closets to connect voice or data wiring (see Cat 5 Block) to customer premise equipment, Suttle offers a complete line of industry standard and Category 5 modular 66 blocks Network Interface Blocks, and associated equipment. The 66-block family consists of 6, 12, 18, 25, and 50 pair blocks, ranging from 2 to 6 clip configurations. Blocks are molded of flame retardant thermoplastic with quick-connect 66 clips for ease of installation and proven termination reliability.